It's the beginning of the end for the planet-encircling dust storm on Mars. But it could still be weeks, or even months, before skies are clear enough for NASA's Opportunity rover to recharge its batteries and phone home. The last signal received from the rover was on June 10. Scientists observing the global event -- which is actually caused by a series of local and regional storms throwing dust into the Martian atmosphere -- say that, as of Monday, July 23, more dust is falling out than is being raised into the planet's thin air. That means the event has reached its decay phase, when dust-raising occurs in ever smaller areas, while others stop raising dust altogether. 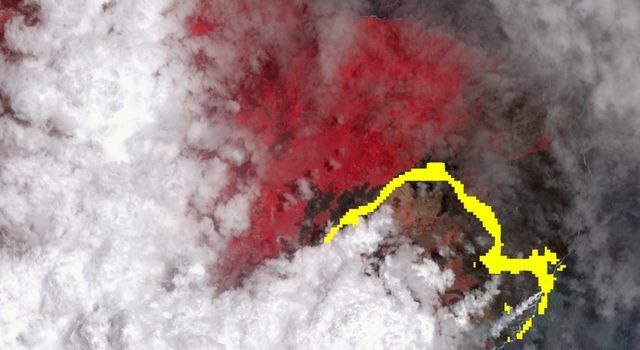 Surface features in many areas are beginning to re-appear as seen from orbit. This should even be apparent through telescopes on the ground: Next week, Mars will make its closest approach to Earth since 2003 -- a particularly good time for observing the Red Planet. Meanwhile, in Gale Crater, the nuclear-powered Mars Science Laboratory/Curiosity rover has noted a decline in dust overhead. 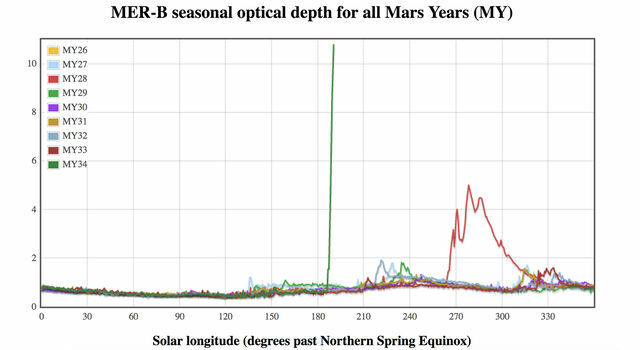 Temperatures in the middle atmosphere of Mars are no longer rising, and in some areas are starting to decrease. That indicates less solar heating by the dust. 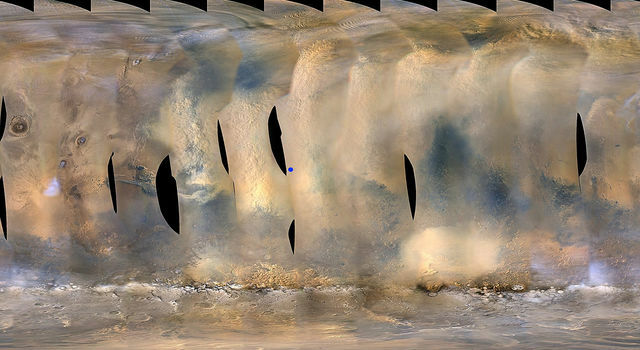 The changes were spotted by the Mars Color Imager (MARCI), a wide-angle camera, and by the Mars Climate Sounder (MCS), a temperature profiler, on NASA's Mars Reconnaissance Orbiter (MRO). MARCI is managed by Malin Space Science Systems in San Diego. 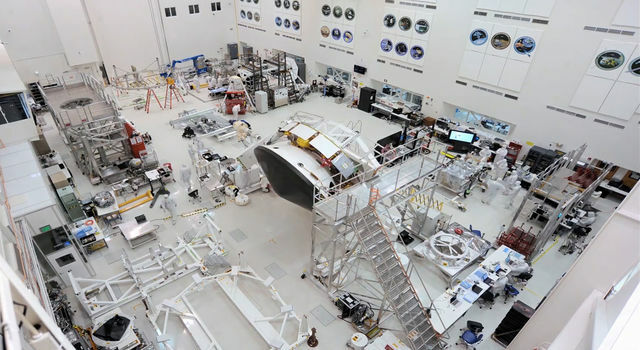 MSL, MRO and MCS are managed by NASA's Jet Propulsion Laboratory. All of NASA's Mars spacecraft have been observing the storm, both to support the Opportunity mission and to collect unique science about this global phenomenon. As of Tuesday morning, June 19, the Martian dust storm had grown in size and was officially a "planet-encircling" (or "global") dust event, according to Bruce Cantor of Malin Space Science Systems, San Diego, who is deputy principal investigator of the Mars Color Imager camera on board NASA's Mars Reconnaissance Orbiter. 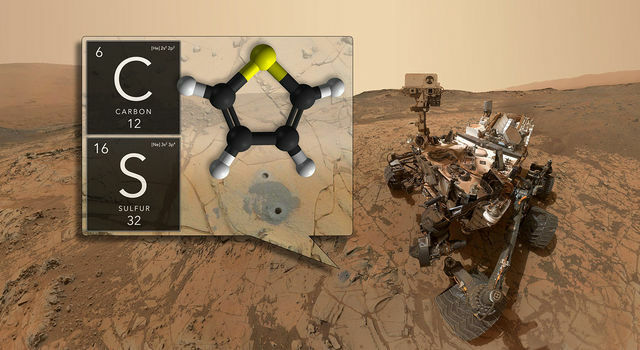 The storm has starkly increased dust at Gale Crater, where NASA's Curiosity rover is studying the storm's effects from the surface. There still was no signal received from NASA's Opportunity rover, despite efforts to listen in case it's coming out of sleep during its fault window -- the period of time when it attempts to communicate. A recent analysis of the rover's long-term survivability in Mars' extreme cold suggests Opportunity's electronics and batteries can stay warm enough to function. Regardless, the project doesn't expect to hear back from Opportunity until the skies begin to clear over the rover. That doesn't stop them from listening for the rover every day. 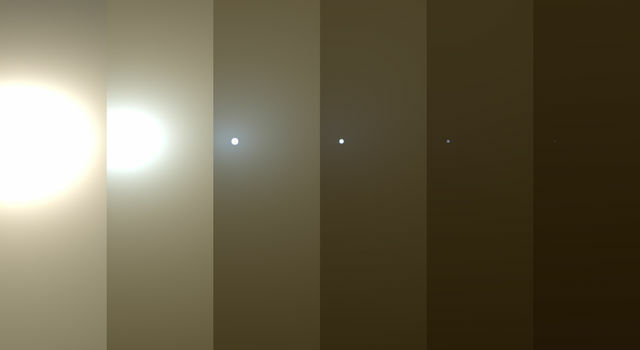 The dust storm is comparable in scale to a similar storm observed by Viking I in 1977, but not as big as the 2007 storm that Opportunity previously weathered. 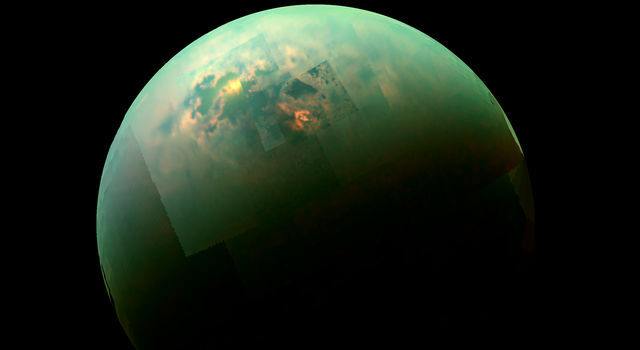 But it's also different than the massive storms observed by Mariner 9 (1971-1972) and Mars Global Surveyor (2001). Those storms totally obscured the planet's surface, save for the peaks of Mars' tallest volcanoes. The current dust storm is more diffuse and patchy; it's anyone's guess how it will further develop, but it shows no sign of clearing. NASA engineers attempted to contact the Opportunity rover today but did not hear back from the nearly 15-year old rover. The team is now operating under the assumption that the charge in Opportunity's batteries has dipped below 24 volts and the rover has entered low power fault mode, a condition where all subsystems, except a mission clock, are turned off. The rover's mission clock is programmed to wake the computer so it can check power levels. If the rover's computer determines that its batteries don't have enough charge, it will again put itself back to sleep. Due to an extreme amount of dust over Perseverance Valley, mission engineers believe it is unlikely the rover has enough sunlight to charge back up for at least the next several days. This isn't Opportunity's first time hunkering down in bad weather: in 2007, a much larger storm covered the planet. That led to two weeks of minimal operations, including several days with no contact from the rover to save power. The project's management prepared for the possibility that Opportunity couldn't balance low levels of power with its energy-intensive survival heaters, which protect its batteries from Mars' extreme cold. It's not unlike running a car in the winter so that the cold doesn't sap its battery charge.There is a risk to the rover if the storm persists for too long and Opportunity gets too cold while waiting for the skies to clear.